Objective. 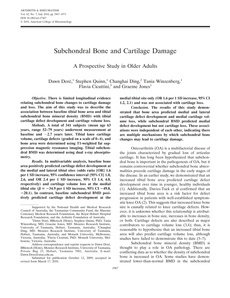 There is limited longitudinal evidence relating subchondral bone changes to cartilage damage and loss. The aim of this study was to describe the association between baseline tibial bone area and tibial subchondral bone mineral density (BMD) with tibial cartilage defect development and cartilage volume loss. Methods. A total of 341 subjects (mean age 63 years, range 52� years) underwent measurement at baseline and 2.7 years later. Tibial knee cartilage volume, cartilage defects (graded on a scale of 0�, and bone area were determined using T1-weighted fat suppression magnetic resonance imaging. Tibial subchondral BMD was determined using dual x-ray absorptiometry. Results. In multivariable analysis, baseline bone area positively predicted cartilage defect development at the medial and lateral tibial sites (odds ratio [OR] 1.6 per 1 SD increase, 95% confidence interval [95% CI] 1.0, 2.6, and OR 2.4 per 1 SD increase, 95% CI 1.4, 4.0, respectively) and cartilage volume loss at the medial tibial site ( 34.9 per 1 SD increase, 95% CI 49.8, 20.1). In contrast, baseline subchondral BMD positively predicted cartilage defect development at the medial tibial site only (OR 1.6 per 1 SD increase, 95% CI 1.2, 2.1) and was not associated with cartilage loss. Conclusion. The results of this study demonstrated that bone area predicted medial and lateral cartilage defect development and medial cartilage volume loss, while subchondral BMD predicted medial defect development but not cartilage loss. These associations were independent of each other, indicating there are multiple mechanisms by which subchondral bone changes may lead to cartilage damage.